My friend Pauline turned me on to Kobo candles and I am hooked. 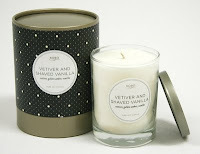 Each candle is hand poured with soy wax and lead free cotton wicks. It is a really great hostess gift too – the glass candles come in a really nice package and they have included long reach matches too! I love the fragrances, but the matches really won me over. And, did I mention how delicious they smell?? ?